Lots of people want to be more healthy after over indulgence at Christmas and soup is a great way to get lots of vitamins and vegetables and give your digestion a rest. Yotam Ottolenghi’s ham hock and red lentil soup. Photograph: Louise Hagger for the Guardian. 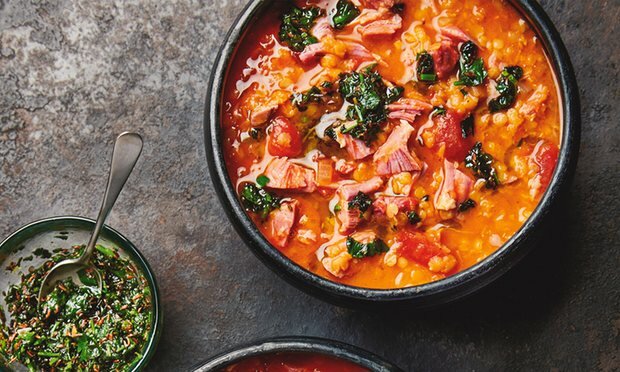 We’ve collected up 10 healthy and hearty winter soups to help you. Try adding some Must Chup “Big Kick” to any of these for a bit of extra zing. And we’ve created our very own Cream of Pumpkin with Must Chup “Big Kick” for you. Do you have any of your own soup recipes you would like to share with us? We will be at Tonbridge Farmers Market regularly this year (normally the second Sunday of the month) and our events calendar for 2017 will be updated very soon with lots of fairs and festivals. Bought a bottle of the 'Big Kick' at Camberley Market last weekend, and it goes superbly with just about any soup. I eat a lot of soup (5:2 diet!) and it really gives it a great extra kick,mourning often boring soups into an absolute pleasure! Well done, good to see an independent retailer producing something so good!